Can you tell me the ceiling height for this room please. I love this room...hello, lover. how large are the crown mouldings? do you have any of the actual styles of these moudlings? thank you! Janie, can you please email me close up pictures of the crown mouldings, baseboards, and door/window casings? We love that look and trying to see what pieces would have to be built up to get that look. This would work great in our home. We have 10 ft ceilings throughout and 14 ft in a great room with a coffered ceilng. Has anyone been able to duplicate the crown moulding, and if so what are the names of the profiles you used? Thank you! if I have brown bass board what color crown molding should I get? - Do I do white even though the bass board is brown? Here are two photos. One shows dark base boards and doors with white casings and crown, and the other one show dark base boards with dark casings and white trim. Hopefully these will help you decide which route to take. Can anyone tell me the RGB values of Benjamin Moore's Revere Pewter? - The Benjamin Moore colours are not available in Australia and I just love the "Revere Pewter" colour! I would really like to use this colour in my home and would appreciate it if you could advise the RGB values and LRV. Did you ever find out the RGB? I would love to use it myself! There is no information like this on their website. I would suggest that you go to www.benjaminmoore.com and click on Contact Us. They have several phone numbers that you can call or email address that you can send questions. I see crown molding painted the same as the ceiling, I see them the same as the wall, I see them in an entirely different 3rd color. We'll have 10ft ceilings in our 2nd floor main living area in our beach house. In the FR will have a coffered ceiling, in the DR, a tray, in the K and BR's just crown. Any recommendations? Thank you hilltop. Good point about the tall ceilings in the BR. There are many ways that you can do them. So that the house doesn't get too busy, you may want to have the trim the same throughout, unless there is a special space where you want it to be different. If you do the ceiling the same color, it will still look a little different since trim is usually painted in a semi-gloss which lightens the color a little bit. I have painted ceilings the same color as the trim, the same color as the walls, half pigment of the walls, or a totally different color. There is not really a wrong answer as long as the colors all work together. Ceiling color - Hi I am considering revere pewter for my walls. Can you please tell me what the ceiling color is here? Is it same as the trim or half formula perhaps? when you say trim - I assume you are talking about all trim including baseboards, and casings. In my house the builder put a off-white/cream colour on trim, ceilings are white, not sure what colour to paint our crown holding now???? Yes, all of the trim is White Chocolate. The walls are Benjamin Moore Revere Pewter and the trim is White Chocolate. Great contrast between these two colors. It is from Murray Iron Works that is a company that sells to the design trade. If you would like me to get a price and information on it for you and the freight estimate to you, please email me at janieh@jhirschinteriors.com. Has anyone been able to figure out the crown molding pieces ? Can you tell me who makes the rug in this photo? Do you know what it's made of, silk or wool, etc? Thank you for your time! The rug is from Moattar at ADAC (Atlanta Decorative Arts Center - a To The Trade Company) and it is a Pakistani One-of-a-Kind 100% Wool Handmade Rug. It is a new Reproduction to look old and is all natural dyes and is 9.1’ x 12.8’. If you would like me to see if it is still available, let me know and I can get the price for you. I am thinking that it was maybe $9000 or so. And where would you want it shipped to if you are interested? You can frequently find similar rugs during the flash sales on One Kings Lane, Gilt, Joss & Main, etc. Wallpaper - Can you tell me where I can find this wallpaper? This is not a wallpaper. It is a silk fabric panel with hand embroidery and beading. 4500 Spanish Oaks. I would like to have the sq ft of this home. - We like the style, was wondering if we could trim it down to at least 3,000 sq ft, we r an older couple with a tighter budget. can you send floor plans. We have already purchased our land and are excited to build in 2015. lleon9consolidated.net is our email. This was part of the 2011 Atlanta Symphony Decorators' Show House & Gardens. You can find more information in the Atlanta Homes & Lifestyles magazine on their website. Look at the September 2011 issue of the magazine at www.atlantahomesmag.com under past issues. Spanish White is fine if you want that much color in your trim. The White Chocolate is lighter without as much yellow in it though. Rooms next to Revere Pewter - What is the color in the adjacent room? 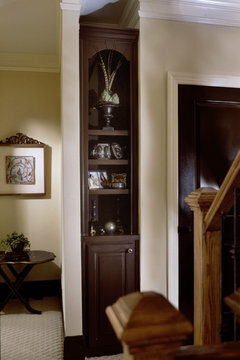 I am using Revere Pewter in the living room and looking for a complimentary color in the hall/entry. Any suggestions? Was white chocolate used in the adjacent room as well? 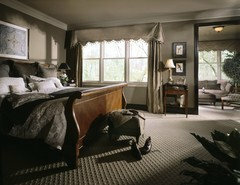 This was one room that I designed in a show house, so I do not have the color in the adjacent rooms. The trim is White Chocolate though. Love that writing desk! Where is that from? It is an antique Spanish Writing Table from Holland & Company at ADAC in Atlanta. Amazing light fixture, that's even more dramatic with crown. Source? I do not have this information since it was a new build for a show house. It is an antique Spanish Trestle table from Holland & Company at ADA in Atlanta. Crown molding - I am wondering if anyone knows how wide the crown molding is and how tall the ceilings are in this room? Thank u so much for your help! It was installed by the builder, but I can estimate that it is between 10"-12" total. The top is a 6" cove molding plus the other pieces. It is a Julian Chichester piece and it also comes in a black stained oak, where this one is bleached oak. You can also get the base by itself. A traditional wall hanging highlights a beautiful writing desk perfectly placed in the room's recessed area. The beautiful amber lamp provides the lighting you'd need for writing letters.